In the early stages of career development, there are countless tricks to adopt as powerful accessories for career exploration. 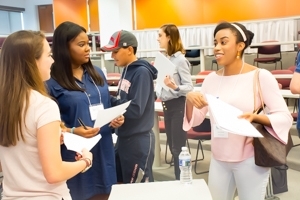 That's why at last week's Professional Development Day, American University staff and faculty, in addition to representatives from NGOs and government, gathered together to teach students how to make positive steps in their career trajectory. Collectively, attendees learned about opportunities in the U.S. Department of Justice, sharpened their interpersonal skills through a networking luncheon and informative workshop, heard from a panel of experts who discussed leadership positions in poverty advocacy. They also took charge of their career development via self-assessment and learned about leadership in the workplace from School of Professional & Extended Studies (SPExS) Dean Carola Weil herself. For those that missed this annual half-day conference, one take-away tip to continue developing life-long professional skillsets is through informational interviewing. David Fletcher, one of the conference's workshop hosts and Director of Career Development at American University's School of International Service, is especially keen on empowering professionals at all stages of their careers to take advantage of this useful practice. In fact, Fletcher notes, even after getting the dream job students should use informational interviewing as a tool to sharpen other aspects of their career development. "People need to be able to market themselves - whether it's in a cover letter or through networking skills. Those skills are essential," Fletcher explains. "You either learn this fully and find great success, or learn it later and maybe struggle with your career success." Indeed, informational interviewing can be used for more than just exploring career possibilities. In fact, these same skills can be used when researching and applying for grad school programs, academic scholarships, research fellowships, and other leadership opportunities. Students and professionals can also use this practice to learn more about their current organization, learn new skillsets and perspectives from experienced colleagues, and stay up-to-date within their industry. "Many internship class professors, including myself, require informational interviews as an assignment. Meeting face-to-face with professionals to hear their unique career stories is so key and students have personally shared with me how effectively it has opened new doors for them in so many ways." Donna Chapman Williams, the Assistant Dean for Student Services at SPExS, agrees - noting that "it is necessary for students to learn about the world of opportunities available to them." Williams goes on to say that "these interviews provide [students] with real insight from experts in their chosen field to help them decide if they are on the right or wrong career path...If that impression is positive, it just might make the difference in whether they get in for the actual job interview sometime in the future." "I often task students with asking a lot of questions, doing a lot of research, getting a lot of perspectives, and then following the advice that they feel is best for them." At the end of the day, the most essential aspect of informational interviewing is the gateway it provides for genuine relationships to unfold between professional colleagues. These relationships, if developed over time, may be essential in helping students, new employees, and seasoned professionals alike achieve their diverse goals. Fletcher concludes: "The more people master this process, the sooner they can get started with their success." Whether it be through its accredited certificates for working professionals or through its mentorship and internship programs for undergraduates, the School of Professional & Extended Studies (SPExS) provides world class experiential learning for individuals across all stages of their career. To learn more about how the programs at SPExS can help students enhance practical skillsets at critical junctures in their careers, visit our website at www.american.edu/spexs.